My colleague Adam Martin discussed the aftermath of Robert Whittaker’s successful “title defense” over Yoel Romero, who missed weight and was ineligible to win the belt. 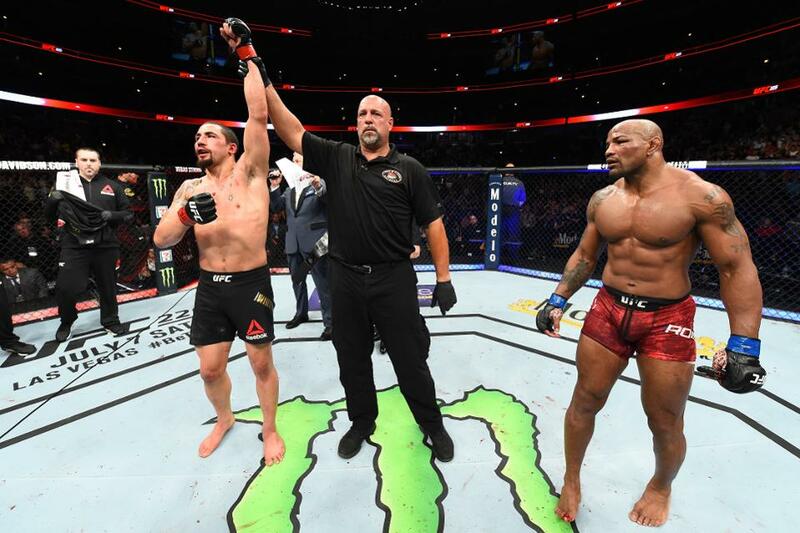 Even though they were close losses, being 0-2 to the current champion, combined with coming in overweight in his last two fights, means that Romero will be forced to the light heavyweight division for the foreseeable future. But while Adam is intrigued by the contenders that remain, I'm considerably less so. Both Luke Rockhold and Chris Weidman were exposed in recent years, and Ronaldo “Jacare” Souza and Lyoto Machida are on the downsides of their respective careers, notwithstanding competitive outings in their last fights. Kelvin Gastelum, while a talent, is still slightly undersized for the division, and his own weight-cutting woes have made competing at welterweight an impossibility. So when it comes to elite talent at 185, the division finds itself well-positioned to line up “names” to bolster Whittaker's resume, but not find contenders who can push the champion the way Romero did. That said, there is a promotional value in a champion that takes scalps, and if Whittaker fought at an aggressive clip, he could possibly add sufficient names to his victims list to make fans forget about the notable omissions, i.e. the two previous UFC Middleweight Champions, Michael Bisping and Georges St-Pierre. They say to be the man you've got to beat the man, and no matter what he accomplishes, he likely won't ever do that. Add in his penchant for missing time due to injury, and he may be left with a reign that's easy to poke holes in. We're asking a lot of the division’s middleweight prospects to inject new blood and excitement into the weight class. I for one hope it happens. But at this very moment I think we may want to temper our enthusiasm for the contendership picture as the remainder of the year takes shape.